St. Joseph, Missouri; 1897. From the Fiegenbaum-Gerber family. This mile stone was reached by Rev. Henry and Mrs. Clara Fiegenbaum of St. Joseph, Mo., on last Sunday April 11th, 1897. Cards had been sent out, announcing the coming event with a reception on Monday, April 12, 1897, at their home, 1123 North 5th Street, St. Joseph, Mo. Sunday, April 11, 1847, found the bridal party in the house of God in St. Louis, Mo., and at the close of the sermon the minister, Rev. Casper Yost, called forward the young couple who wished to be joined in holy matrimony and then and there pronounced them husband and wife. Last Sunday, April, 11, 1897, they had reached the Golden stepping stone, and true to their early faith, wended their way to the house of God. It being Palm Sunday, they found the church a bower of palms. At the close of the sermon, Rev. Charles Harmes, pastor in charge, called forward the bridal party, and seating them before the altar delivered a fitting address to them, and in connection read a poem written for the occassion [sic] by Rev. J. A. Reitz, of Junction City, Kansas, Mrs. Dorethia [sic] Lahrman, of St. Joseph, Mo., the only living guest and witness of the marriage in 1847, acting as one bride's maid and Mrs. Dorathea Balcke as the other bride's maid. After the wedding ceremony, the bridal party went to their home where a 5 o'clock dinner was served. Those present were Rev. F. Fiegenbaum and wife, of Oregon, Mo. ; Dr. J. F. Heinz and wife, Dr. H. R. Riemer and wife, Rev. J. A. Mueller and wife, Rev. Chas. Harmes, Mrs. Rev. J. G. K[o? ]st, Mrs. Rev. Geo. Schatz, Mrs. Rev. 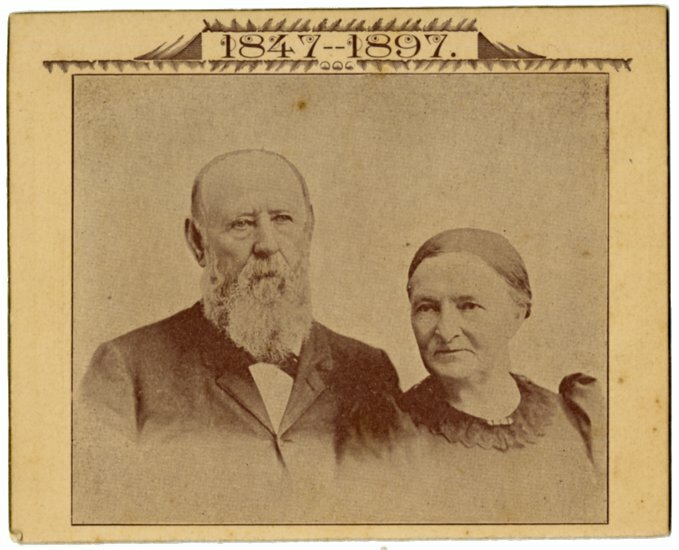 H. Lahrman and Mrs. Rev. F. Balcke, and Miss Eda Heinz, all of St. Joseph, Mo. ; Tom Curry, wife, children, of Oregon, Mo. ; J. C. Steinmetz and wife, Adolph, Clara, Nettie, Emma, Addie and George Steinmetz, Julia and May Neudorff, Misses Mary and Anna Fiegenbaum and Miss Lydia Gutknecht, of St. Joseph, Mo. As early as Thursday the letters of congratulations came rolling in, and by Wednesday, 100 letters and fifteen telegrams had been received. Donations from friends were numerous and expensive, and true to the Golden Standard of our country, the bridal couple received one dollar each for every year of connubial bliss. Rare coins, such as a $2½ gold piece, coined in 1847, and $1.00 gold pieces were found among the presents. It would be well to give a short sketch of the lives of this worthy couple. Henry Fiegenbaum was born in Ladbergen, Prussia, Oct. 16, 1820; came to America with his parents in 1832, by the way of New Orleans; thence up the Mississippi river to St. Charles county, Mo., and in 1845 to St. Louis, Mo. Mrs. Clara Fiegenbaum (nee) Kastenbudt, was born in Osnabruck, Hanover, Dec. 9, 1823, and came to America in 1844, first going to Cincinnatti [sic] and thence to St. Louis, where in 1846 she united with the German M. E. church, and it was then and there that these two hearts met and in the same church where each were converted and joined that the marriage ceremoney [sic] was performed, Sunday, April 11, 1847, that made them one for life - for better or for worse, and in looking back over the years, they cannot but say: Truly, the Lord has been good unto us. In 1847 Mr. Fiegenbaum received exhorter's license, and in 1848 was sent out to fill a charge at Okoe, Ill., until conference. He joined the Illinois conference and was sent on the Belleville circuit. 1848 to 1850 they were stationed at Mascoutah, Ill.; 1850 to 1852, Muscatine, Iowa; 1852 to 1860 in Galena, Ill.; 1860 to 1864 in Wapello, Iowa, Presiding Elder; 1864-1867 in Pekin, Ill.; 1867 to 1870 in Quincy, Ill.; 1870 to 1872 in St. Joseph, Mo., Presiding Elder; 1872 to 1875 in Oregon, Mo. ; 1875 to 1883 in St. Joseph, Mo., Presiding Elder; 1883 to 1886 in St. Joseph, Mo., as station minister; 1886 to 1889 in Sedalia, Mo., and finding his health failing him retired from active charge in the ministry and found a home in St. Joseph, Mo., from whence they celebrated their Golden wedding on last Sunday. "But they that wait upon the Lord shall renew their strength; they shall mount up with wings as eagles, they shall run and not be weary; and they shall walk and not faint," - has been verified in the lives of these servants of God, and that they may spend the remainder of their lives in sweet communion with that Master and friend in whom they have trusted all these years, and that they may have a glorious golden sunset with a golden sunrise in the better world, is the wish of their many friends, both far and near. Source: "Half a Century," in The Holt County Sentinel (Oregon, Missouri); Friday, 16 April 1897; page 4, columns 3-4. Digital copies accessed through Chronicling America: Historic American Newspapers (The Library of Congress) in November 2011. The image available with this digital copy of the newspaper article is of very poor quality, but it is possible to recognize it as the photo used on the anniversary card shown at the top this web page. A digital copy of the studio portrait has been very generously provided by W. Richard Nelson, Jr. and is available on this site in our collection of photos. Rev. Casper Jost (as his name appears in all of the church documents I have consulted) emigrated from Germany in 1840 and settled first in Cole County, Missouri. He was received into the Missouri Conference in 1844; the South St. Louis mission was his first appointment. In September 1845 at the annual church conference at Springfield, Illinois, he was ordained a deacon and appointed to the North St. Louis station. He was ordained an elder in September 1846 and continued his work in St. Louis. In September 1847, a few months after marrying Heinrich Hermann Fiegenbaum & Clara Catherine Kastenbudt in St. Louis, Pastor Jost was appointed to the Milwaukee mission. Rev. F. Fiegenbaum and wife, of Oregon, Mo. This is Henry Fiegenbaum's younger brother, Friedrich Wilhelm Fiegenbaum, and his wife, Louisa Otto. Friedrich Wilhelm was a pastor in the German Methodist Episcopal Church, as were all three of Henry's brothers. He had served the local congregation at Oregon, Holt County, Missouri, from 1892-1896 and continued living there in his retirement until about 1902, at which time he and Louisa moved to Wathena, Doniphan County, Kansas. Tom Curry, wife, children, of Oregon, Mo. Christina Wilhelmine "Mina" Fiegenbaum, Henry and Clara's sixth child, was married to Thomas Curry, part owner of The Holt County Sentinel. They lived in Oregon, Missouri with their two children, William R. Curry and Anna Helen Curry. Henry and Clara's third child, Caroline Katherine "Carrie" Fiegenbaum, was married to Johann Carl Conrad Steinmetz. Their children were: Adolph H., Clara Gertrude, Annette "Nettie" W., Emma Theodora, Adelia "Addie" Lasette, and George Harold. The family lived in St. Joseph, Buchanan County, Missouri. Lizette Clara Fiegenbaum, Henry and Clara's seventh child, had married Frederick Franklin Neudorff in 1881 at St. Joseph, Missouri, where Frederick was involved in retail merchandising, especially hardware. They had three children: Julia W., Franklin Grant, and Clara May. Lizette (or Lisette, as she is sometimes identified) died on 6 February 1892 at the age of 29 years. Her son, Franklin, died on the 22nd of the same month. Frederick Neudorff remarried in 1893, to Mary Bauer; they were the parents of four children. These six members of the family are not mentioned as guests at the anniversary celebration. These were daughters of Henry and Clara. Anna Maria Fiegenbaum, known as Mary, was blind from about the age of 10. Anna Julia, called Anna, worked as a sales person in St. Joseph department stores. Neither woman married; they lived with their parents, and then later lived together. Judging by mentions in The Holt County Sentinel, Mary does not seem to have gotten out much, but Anna often attended social gatherings and church affairs in Oregon, Missouri and elsewhere in the state. In 1901, she spent the summer traveling out west – in California and Oregon. Family members who live in Germany and who have examined the archives of the evangelical churches of northwestern Germany report that Heinrich Hermann Fiegenbaum was born on 15 October 1821 (not 1820) in Lengerich, Province of Westphalia, Kingdom of Prussia. Heinrich's father, Adolph Heinrich Fiegenbaum, was born and raised in Ladbergen, but moved to nearby Lengerich, the home town of his wife, Christine Elisabeth Peterjohann, after their marriage in October 1820. Their first five children were born in that community. The sixth and last child, Heinrich Rudolph, was born after the family emigrated to Missouri. The story of the Fiegenbaum-Peterjohann family's immigration to Missouri is complicated and is discussed in full in the Migration section of this web site. Here it is sufficient to say that I believe the parents and five children, ages about 12 years to about 1 year, arrived at New Orleans, Louisiana in late June 1834 and traveled up the Mississippi River, reaching St. Louis, Missouri in early July, perhaps about the 3rd or 4th, as Friedrich Wilhelm Fiegenbaum recalled. The family appears to have settled initially in Femme Osage Township, St. Charles County, Missouri. Within a few years they moved to nearby Warren County, Missouri, not far from where Adolph's brother and his family settled upon arriving in the state in 1841. By the middle of 1850, four of the children had married and set off on their own. Adolph, Christine and their two youngest sons, still living at home, relocated to a farm near Wapello, Louisa County, Iowa. The service of this branch of the Fiegenbaum family in the German M. E. Church is another complicated story. To do it justice would require an essay devoted to that topic alone; it is yet to be written. In the meantime, you will have to do some of the heavy lifting yourself and piece together the story from the scraps I have managed to gather. Heinrich Hermann Fiegenbaum and his three brothers were all pastors in the German Methodist Episcopal Church. His two sisters were married to pastors in the same denomination. It was the practice of the Church to move its ministers to new appointments frequently; often every two to three years at the start of their careers, less often later in life. During this era of the Church's history, it was not uncommon for an appointment to include a circuit of charges composed of a number of separate congregations, each of which might be in a different stage of development and also some distance from one another. The figure of the circuit pastor (in German, Reiseprediger), on foot or horseback, braving all manner of weather and away from home for extended periods, is a icon of Methodist Church history, even if he is not unique to that tradition or time period. The role of itinerant ministers in the family's early life in Missouri and in their introduction to Methodism is described in an essay written by Henry's brother, Hermann Wilhelm Fiegenbaum, in an autobiographical sketch written by his sister, Marie Wilhelmine (Fiegenbaum) Winter, and in an article about these Fiegenbaums, published in the St. Louis Post Dispatch in 1898. Henry's brother, Friedrich Wilhelm Fiegenbaum, paints a vivid picture of his own life as a pioneering pastor in the autobiographical letter he composed for his children. As the western frontier of the nation became more settled throughout the 19th century, the Methodist Church found it necessary from time to time to reorganize itself, creating new conferences and districts. Pastors who might be engaged in the same work as before could suddenly find themselves with a new affiliation. Or, they could find themselves transferred to a new section of the country. For the modern researcher, church records of the individual you are studying now reside in a different repository or have been published by different agencies. On top of all of that, I suspect that at least one of the Fiegenbaum brothers had his own wanderlust that was quite unconnected to any calling or career that he might have chosen. Successfully following the movements of Adolph and Christine's children through this personal and bureaucratic flux requires some concentration and a fair bit of luck. I am not confident that the picture of their adult lives that I have assembled to date is complete or accurate. You can find these developing stories briefly outlined in any of the More Resources documents listed below which mention a chronology. The true identity and location of Okoe, Illinois, mentioned as Henry's first charge, remains a mystery to me. I have not yet been able to find any city, town, township or village with this name. The rest of the locations are mentioned in the biographical material and chronology for Henry.